According to the model of the Universal Accelerator the earth is accelerating upwards. We are pinned down to the surface of the earth as a mechanical function of this acceleration. This is what creates "gravity" as experienced on earth. There are numerous pieces of evidence that the earth is accelerating upwards. One of the primary proofs for the Universal Accelerator is the fact that bodies fall without inertial resistance. It is an unexplained coincidence that Inertial Mass is exactly equal to Gravitational Mass. This coincidence has been called "one of the deepest, unsolved mysteries that exists in fundamental physics" and is a question which has vexed science for hundreds of years. Not only is it a conundrum that the Inertial Mass laws should equal out for Gravitational Mass, but the strong form of the equivalence principle declares that all laws of physics are the same. Why does the physics of gravity behave exactly as if the earth were accelerating upwards? The Universal Accelerator answers this long-standing mystery, which has baffled generations of scientists, by positing that the earth is accelerating upwards. Other pieces of evidence range from the fact that, despite great effort, the mechanism for gravity has not been discovered, the point that the current theories of gravity cannot explain much, vertical light velocity experiments, to empirical proofs. There are two ways of thinking about mass. According to inertial mass an object’s mass is its “resistance” to being moved, this being greater the more massive it is. The other way to think of mass comes from gravity: According to gravitational mass, the force of gravity experienced between two masses, such as an apple and the Earth, is proportional to the product of their masses divided by the square of the distance between them. This force causes a falling apple to accelerate. If, and only if, the two definitions of mass are exactly the same, the gravitational acceleration doesn’t depend on the amount of mass being accelerated. Think about it: If, through the laws of inertia, a heavier mass has greater resistance to being moved, why should gravity accelerate both an elephant and a book at the same rate towards the earth without inertial resistance? Any body that is being pulled or pushed through space should be subject to the laws of inertia. Bodies of a greater mass should experience more inertial resistance than bodies of a lesser mass. “ Imagine that you are stationary, and standing on the surface of the earth. Gravity feels like a force that is holding your gravitational mass to the earth’s surface. Yet when you are standing in a rocket undergoing accelerated motion (far from gravitational fields, moving with an acceleration of 1 g), the principle of equivalence tells us that there is an identical force exerted against the rocket floor by your inertial mass. However, this force is now caused by your dynamic accelerated motion through empty space. While standing on the earth, however, you were definitely not in motion. Why should there be such a deep connection between what appears to be two completely different physical phenomena: a static force of gravity with no apparent motion, and a dynamic force due to the accelerated motion of your mass? In other words, why should you weigh the same in the rocket as you do on the earth? The principle of equivalence encompasses this strange ‘coincidence’, and is one of the founding postulates of general relativity theory. In it’s stronger form, it states that all the laws of physics are the same in the above thought experiment. When stated in it’s weaker form, it implies that objects of different mass fall at the same rate of acceleration in a uniform gravity field, and that only laws of motion of physics are the same. Equivalence also means that the inertial mass, i.e. the mass defined by Newton’s law of motion: mi = Fi / g is exactly equal to the gravitational mass, which is mass defined by a completely different law given by Newton’s universal gravitational law: mg = Fgr2 / GM (where mi and mg are the inertial and gravitational mass of an object, Fi and Fg are the inertial and gravitational forces exerted on the object, g is the acceleration of the object, M is the mass of the earth, r is the distance from earth’s center, and G is Newton’s universal gravitational constant). Newton was well aware of this coincidence of mass equivalence, which we refer to here as the Newtonian mass equivalence principle. The equivalence principle demands that that mi = mg. Why should this be true in our universe? It has been about 85 years since the discovery of the Einstein equivalence principle, and hundreds of years since the discovery of Newton’s mass equivalence principle. Yet, it is still not understood why inertial mass exists in the first place, or why a mass opposes acceleration with a back acting inertial force. More importantly, it is also not known why there are two totally different physical definitions for inertial and gravitational mass (instead of just one). Einstein's argument in the video is that Newtonian Gravity is curious in that it operates as if the earth were accelerating upwards. There are too many coincidences with Newton's gravity, Einstein says. It makes more sense if the earth is accelerating upwards. Secondly, objects in free fall experience an opposite "fake" force of gravity of the same magnitude to the reverse of inertial laws, in which they are exactly weightless. Another astronomical coincidence. Einstein says that the idea that the object is stationary and the earth is accelerating into it is the best conclusion and the best way to make sense of Newton's Gravity. The Flat Earth concept comes in because it's not possible for the surface of the Round Earth model to continuously accelerate upwards. An upwardly accelerating surface suggests that the earth is flat. The video presenter further states that seven years after coming up with the Equivalence Principle Einstein ends up adapting his upwardly accelerating earth theory to the Round Earth model by using non-Euclidean bending space to achieve the accelerating earth illusion of gravity on a Round Earth. The end of the video says that Gravity is an illusion in GR. The author clarifies that "it turns out that inertial frames in curved space-time can do almost anything they want". Under the space-bending schema of General Relativity the arc of a basketball makes a "straight line path" to its destination. It is the environment that moves into the basketball, simulating an accelerating earth. There is an offhand comment in the video from the Newtonians that falling bodies would fall towards each other, since they are falling towards the center of a presumably round earth. However, it should be noted that this has not been met with experiment. A feature article from New Scientist declares that the mysterious equivalence principle coincidence is one of the primary problems holding back the progress of physics. “ COINCIDENCE is not generally something scientists have much truck with. If two things are genuinely unrelated, there is little further of interest to be said. If the coincidence keeps turning up, however, there must be some deeper underlying link. Then it is the job of science to tease out what it is and so explain why there was no coincidence in the first place. That makes it rather odd that a large chunk of modern physics is precariously balanced on a whopping coincidence. This coincidence is essential to the way we view and define mass. It is so fundamental to the world’s workings that most of us encounter its consequences every day without giving them another thought. Yet it has vexed some of the best minds in physics for centuries. Galileo and Newton grappled with it, and ended up just accepting it, rather than understanding it. Einstein went one better: he declared it a principle of nature. He went on to use this “equivalence principle” as the fundament of his general theory of relativity, still our best stab at explaining the mysterious force of gravity. Galileo Galilei was among the first who experimentally realized that all bodies accelerate at the same rate. 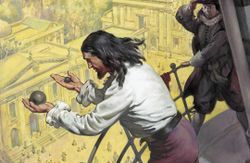 He is said by some to have dropped two spheres of different masses from the Leaning Tower of Pizza to demonstrate that their time of descent was independent of their mass. Between 1885 and 1909, Roland von Eötvös verified the equivalence principle with the accuracy of 11 significant figures. Modern tests in this family have increased it more than 17 significant figures. The Equivalence Principle is continuously tested, in many different scenarios, to the best ability of modern physics. Professor Brian Cox visits the world's largest vacuum chamber to perform a very illustrative version of Galileo's Drop Test of two bodies of different masses. 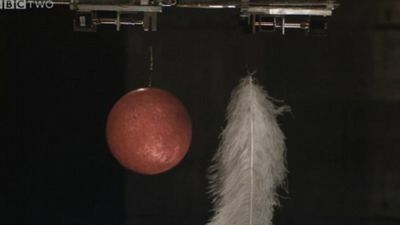 A bowling ball and a feather are dropped simultaneously in a vacuum chamber to demonstrate the principle of equivalence. Notes: Two versions of the experiment are performed, one with air resistance and one without. While the bowling ball and feathers drop at the same rate in the version without air resistance, and in accordance with the equivalence principle, at 2:51 of the final release closeup in the vacuum some of the barbs of the feathers are seen to slightly move when they are released. This would be because, assuming that there is negligible residual atmosphere, the feathers were being pulled upwards and are inert when released, causing brief movement of the elastic barbs. At the moment of release the feathers cease being accelerated upwards and the barbs briefly straighten out to their natural position. At 4:15, when replaying the short final release closeup in the vacuum, the barbs are seen to move wildly when released. This is an apparent production error, reusing a closeup of the first version of the experiment with air resistance. The video is worth a viewing, despite of this. Incredibly sensitive experiments have been carried out, showing that the Equivalence Principle even applies on the atomic level. In 2017 a cryogenic resonator was used to make one of the most sensitive tests for the principle of equivalence and discount spacetime foam. “ In their study published in Physical Review Letters, E. Wiens, A.Yu. Nevsky, and S. Schiller at Heinrich Heine Universität Düsseldorf in Germany have used a cryogenic resonator to make some of the most precise measurements yet on the length stability of a solid object. Overall, the results provide further confirmation of Einstein's equivalence principle, which is the foundation on which the theory of general relativity is based on. And in agreement with previous experiments, the researchers found no evidence of spacetime foam. A University of Washington slideshow (Archive) goes over the various types of modern equivalence principle tests, including the classic Galileo Drop Test which tests if drop time is equal, the Newton-Bessel Torsion-Balance Tests which tests if periods are equal, and the Eötvös Tests which testes whether angles are equal. “ The EP is one of the most precisely tested principles in all of physics with many broad implications. Gravity is often described as an attraction between masses. However, the Equivalence Principle demands that photons, despite being mass-less, will seem to fall to earth like other bodies; exactly as if the earth were accelerating upwards. The Michelson-Morley Experiment was a famous experiment designed to measure the velocity of light, and which was historically performed on the horizontal. The Michelson-Morley Experiment has popularly reported no difference in the velocity of light in any horizontal direction. Of interest, in recent years there have been a number of interesting vertical Michelson-Morley experiments which have asserted to detect a difference in light velocity when the interferometer device was inverted vertically. Discussion of these experiments are ongoing. 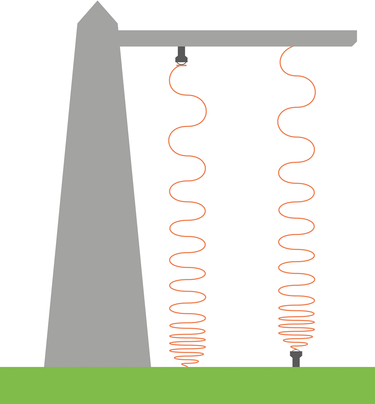 Typical criticism of these experiments are that the components might be affected by stresses of 'gravity' when rotated into the vertical position. Various experimenters have since sought to mitigate concerns by designing the experiment specifically around such considerations. In several instances the author describes it as an "accelerated flow". The author encourages repeats of the experiments. In the article Prof. Zielinski proceeds to provide interesting theories of the phenomenon for the Round Earth model. Zielinski is listed as a professor (p.2) on a committee of the International Scientists' Club. Sometimes this experiment is called a "proof of General Relativity," but it is a test of the Equivalence Principle which exists within General Relativity. The Equivalence Principle was created years prior to GR. The Equivalence Principle, with the same experimental results, would need to exist in any alternative theory of gravity, such as the theory of the Graviton messenger particles as proposed by Quantum Mechanics. The cornerstone of the Equivalence Principle maintains that gravity and all physical effects operate exactly as if the earth were accelerating upwards. Gravitational Time Dilation is predicted by the Equivalence Principle, which suggests that two clocks at different altitude will seem to measure time at different rates when compared to each other. “ however, he observes that the ceiling clock is running faster. The ceiling clock sends a tone (in the form of a radio wave) down to the floor. Because the floor is accelerating upwards, it intercepts the radio wave sooner than if the rocket were merely coasting along. If the acceleration continues, subsequent tones also arrive earlier than expected. In the viewpoint of the astronaut on the floor, the ceiling clock is broadcasting its time intervals at an increased rate, and is running fast compared to the floor clock. The authors explain that time dilation should be a natural consequence in an upwardly accelerating rocket, and acknowledge that its application to gravity on earth is "strange" and "bizarre". Aside from bizarre experiments and massive coincidence, one may reason that the earth is accelerating upwards simply because that is what we observe it to be doing. Experiment 1: Step up onto a chair and step off of its edge while watching the surface of the earth carefully. If you pay attention closely, you will observe that the earth accelerates upwards to meet your feet. Take note of any graviton puller particles or bending space that you observe during the experiment. Experiment 2: Now find a ball and raise it into the air with your hand and let it go into free-fall. As it does this, as well as before and after, you should simultaneously feel the earth pressing upwards against your feet. This tells us that we are being pushed to be in the frame of reference of the earth, as the earth runs into the ball. Again, take note of any observed graviton puller particles or bending of space that you observe in this experiment. To the rationalist the above experiments might appear to be futile, but to the empiricist, the fact that one mechanism is observed and not others is grave. While the proposed mechanisms of "graviton puller particles" and "bending space" versions of gravity in Quantum Mechanics and General Relativity, which Scientific American describes as 'whooping coincidence', provide equivalent, if absurd, explanations to the results of the above experiments, those things are completely undiscovered and unobserved, and so, are decidedly less empirical. We can see that the earth moves upwards, while we must imagine that there are hypothetical puller particles or odd properties to space. The above results and interpretations of the experiments apply not only to our human experience, but to our most sophisticated man-made instruments as well. In order to argue that the above experiments can also be explained as "falling" we must imagine something invisible that pulls. We can imagine many explanations and mechanism for the phenomenon of gravity, each which incorporates the mystical equivalence principle, but they will be completely hypothetical and frivolous. None are as strong as a pushing mechanism that we can directly observe and experience. In contrast to the mechanisms of its opposition, which are entirely unobserved and unexperienced by any man or machine, the mechanism of the upwardly accelerating earth can be directly observed and experienced by all. The power source for the Universal Accelerator is beneath the earth and the earth's possible sub or super-structures, pushing it upwards, and is thus, not experienced. The place to detect it would be beneath the earth. The power source for gravity, which allows mass to pull mass, however, should be all around us, and its mystery inexcusable. Why should something that is allegedly all around us be undetectable by all of science? State-of-the-art Physics has dedicated itself to finding a slight inequality in the Equivalence Principle. Why does gravity behave exactly, on all physical levels, as if the earth were accelerating upwards? It is widely expected that unveiling this deep mystery would lead to a profound breakthrough in physics, usher in a new scientific revolution, and give fundamental insight into the workings of gravity and the forces. The Flat Earth Society proposes that there is no profound and mysterious coincidence. These exacting and increasingly sophisticated tests speak to, not an increasingly mysterious answer, but to an increasingly obvious and apparent one. An upwardly accelerating earth is the best explanation, and is dutifully supported by experimental evidence of the highest caliber. Any contradicting form of gravity will, therefore, need to answer for the stated coincidences. If an object is being pushed or pulled through space, then that object is subject to the laws of inertia. If one pushes a marble along the ground, it is very easy. If one puts a car into neutral and pushes it down the road, it is much more difficult. When an object is being pushed or pulled through space, it must exhibit inertial resistance. Again, it is asked that, since a heavier object has greater resistance to being moved through space via the laws of inertia, how is it that two objects of significantly different masses are moved towards the earth at the same rate and without any sort of resistance? Further, perhaps even more extraordinary, as per the strong equivalence principle, are we to believe that all physical laws, some very different to each other — electrodynamics, electromagnetics, fluid dynamics, buoyancy, chemical kinetics, &c. — are all perfectly compensated for under their respective paradigms and laws, as exemplified with the inertial laws above, to justify why gravity operates exactly as if the earth were accelerating upwards? These questions are certainly deserving of answers. Who, among gravity's learned proponents, or any challenging gravitational theory, is to explain such a thing? This page was last modified on 17 April 2019, at 17:24.